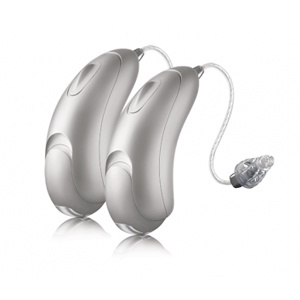 The advanced tech device Unitron Moxi All Rechargeable 800 hearing aid runs the latest Unitron platform that creates the best conversation experiences. The hearing aid is built with Bluetooth direct connectivity to any mobile device including Apple iPhones and Android smartphones. The device uses the rechargeable siver zinc batteries together with a charging base and a specialised battery door to allow power regeneration.